Drop Zone FFC offers an area for just the adults to hang out. The “Time Out” Lounge has 3, 75 inch TV’s complete with DirecTV, a state of the art golf simulator, and tables for you to sit and relax. Parents come on in and enjoy your time while the kids jump! Alcoholic Beverages – COMING SOON! 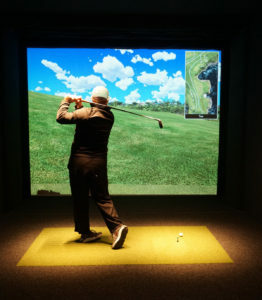 The Golf Simulator features over 30 nationally ranked courses as well as several practice settings including chip and putt, driving range, and others! The prices for the golf simulator include up to 4 participants!